Fall is my favorite time to fluff the nest! The shorter days means less daylight to work on projects, the cooler temperatures sure help. So let's get painting! I'm sure the shop owners shop owners and workers were laughing as we walked out the door with the old frames. The frames looked really bad and didn't give much hope of looking better any time soon. The sellers must have thought what a stroke of luck to find anyone who would actually pay money for that old junk. But their junk was a perfect find for me. This one was actually in two pieces. The inside needed to be reattached to the outside molding. And some of the original carving was missing. It was certainly past its prime in life. It made me so want to make it look good again. Here's how work with different colors and using a wet distressing technique. It would also have looked very good with just a simple white finish, either in flat or a gloss. Just a fresh coat of paint would be huge improvement for sure. 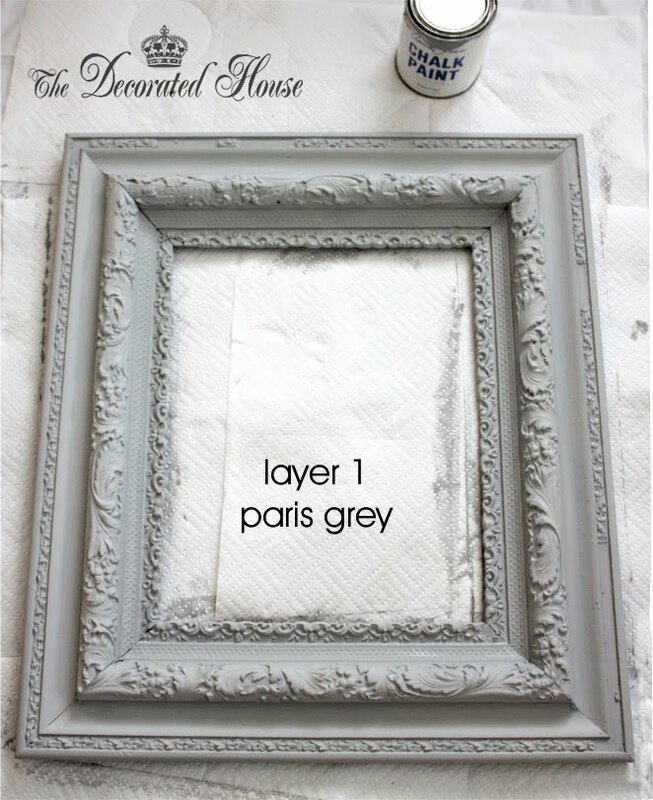 But after it sat patiently waiting for me to get to it, it kept whispering.... Paris Grey. And indeed, it looked pretty good with just a cleaning and a fresh coat of Annie Sloan Paris Grey chalk paint. Only now it didn't look so very old and charming anymore. Previously I had let painted pieces sit over night, the way it is recommended that you do with the AS chalk paints. This time, while I was painting the mirror, I let it sit for a short time then rubbed it with a damp rag to get this look. Surprisingly to me, rubbing it after it sat over night did not remove any of the paint. Sanding of course did. The next step was to apply an umber glaze. I mixed umber acrylic paint with a bit of the Paris Grey and a little water as needed. As soon as I applied it, I wiped it off the higher areas with a soft, damp cloth. In the picture above you can see where the glaze has been applied on the inside and compare it to the outside without the glaze yet. Let the umber glaze dry well after step 2. Then begin to dry brush the higher carved areas with white. In this case I used half Old White chalk paint and half flat white in order to get more white, but not a stark white. 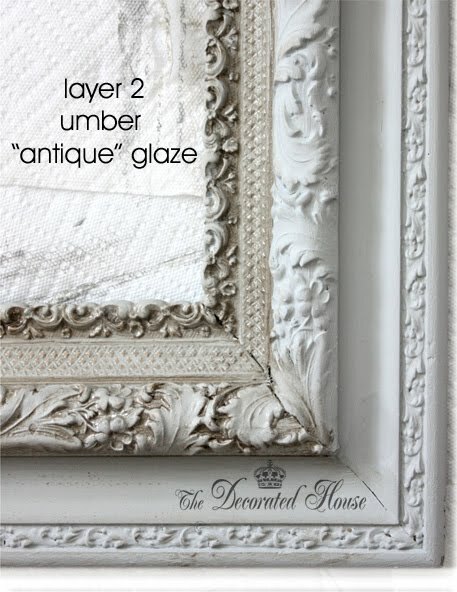 In the above picture, the white has been applied to part of the frame so you can see the difference of where there is still only the glaze. After dry brushing with the white, you might want to do a bit of detail work with the umber. You can use a small brush and go back and accentuate an area like you see above where there are grooves or a space between two areas, or where you might have more white or gray than you want. Almost done and you can see a tiny bit of sanding for distressing and a very light touch of white dry brushing on the straight gray areas. You can also see a close up of the missing carvings. If you are working with something that is in this kind of condition, just embrace the beauty of its imperfectness! It's unique and you created it. Most things that are truly old and beautiful have some "imperfections" that only add to its beauty. If you really want to repair it, you can also make a mold of the parts that are there, and then make the missing pieces from plaster of paris or molding compound. Lastly the AS wax made a big difference for this finish. Some of what appears white above, it really the sheen. The wax really gives a beautiful glow to your work. I used the clear wax first, then some of the dark sparely where I wanted it, and then the clear again to remove any excess dark. Then buffed and buffed. None of the original gold came through when I sanded. So I used gold leaf colored Rub-n-Buff with a very light hand. Just enough to give the illusion that the gild had been underneath. 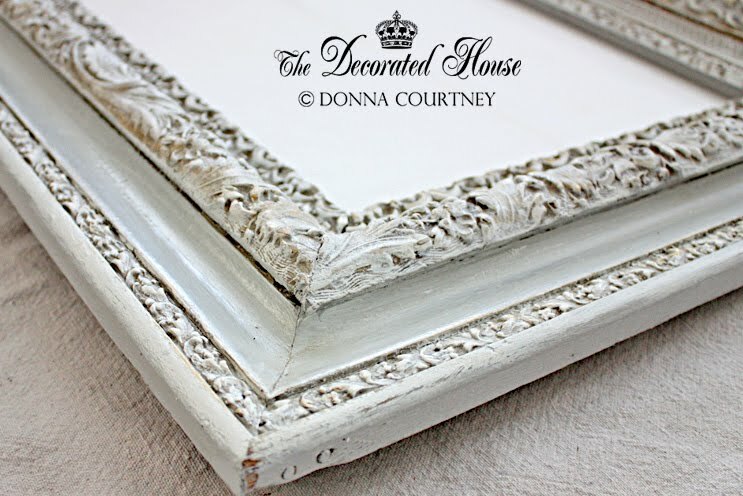 You can see in the picture below from when I used the frame at Christmas time, I changed the curved inside strip by painting it a metallic gray silver. Beautiful! Love all the layers. What a gorgeous transformation! The frame looks fantastic, nicely done. You really found, and created a treasure. You did a beautiful job, love it! That's beautiful and I love it's "imperfectness"! 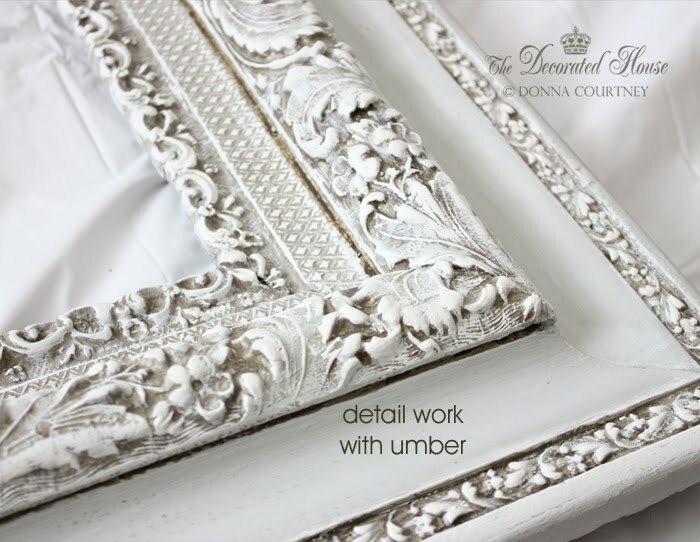 What a beautiful frame, Donna, even missing some of the detailing! It turned out beautifully! I love the use of the umber glaze. I just did the Paris Grey and a dry brushing of the Old White on a frame I redid, but I really like the depth you got with the glaze thrown into the mix. Of course I agree with all of you! It is the imperfectness of the frame that makes it kind of special. 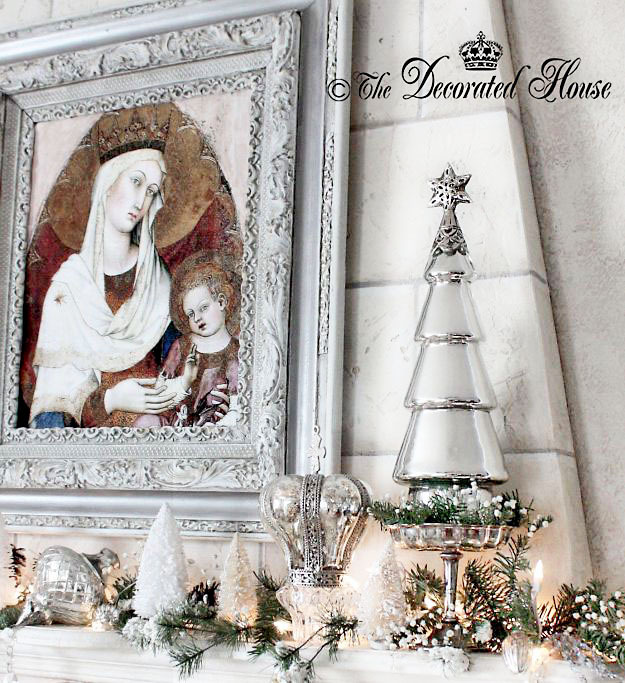 Layering the paints and glazes allows you to create something that is perfect for you and your decor. I love how your frame turned out! 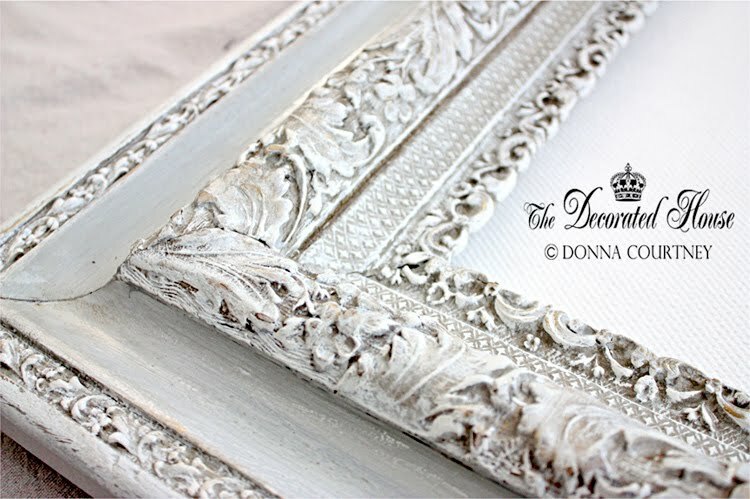 I just redid a large ornate frame myself and will be unveiling that project on my blog soon. Hope you can stop by sometime. Just gorgeous! Wow, you have soooo much patience to do all these layers. Adding the gold back is a novel idea. Wow I really like this look. I've seen this but didn't know how it was achieved. I love what you did with the glaze...in the corners and in between everything. turned out beautiful. I found a wonderful ornate frame at my daughter's college that someone was throwing out, when we were moving her stuff out for summer. I couldn't believe it, did a happy dance to the car. She just laughed. I may try this. Now to find Paris Gray...love that color. That is very very well done! I LOVE the finished piece! Gorgeous! Layering the colors is lovely--you did a fantastic job! Happily following now so I can see more beauties like this! Thanks for the step by step! 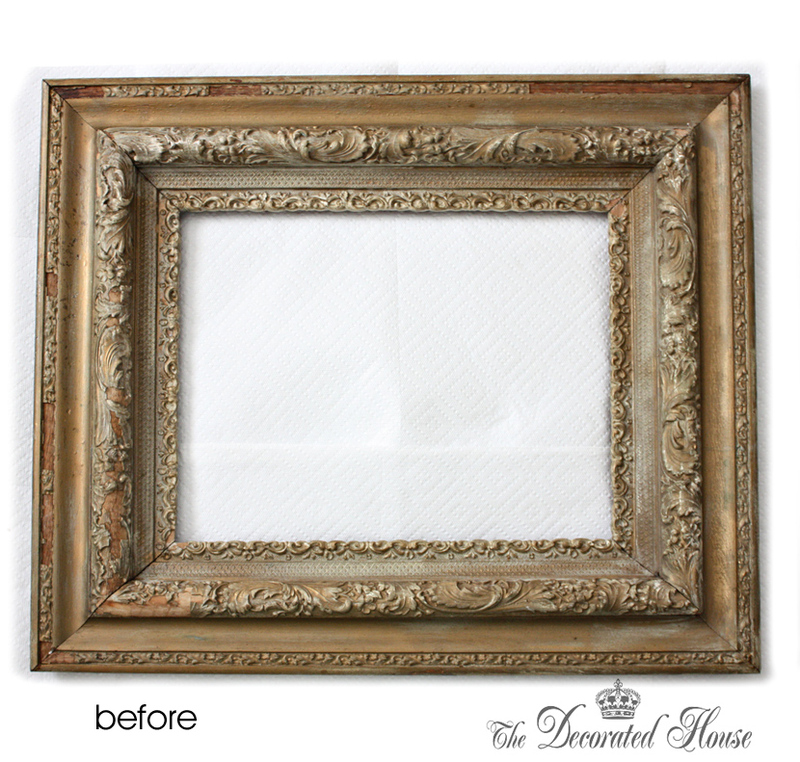 I love what you did to the picture frame, this is the 2nd blog i have seen using annie sloan paint, now i have to try it too! :) great blog! what a beautiful job you did on this frames. 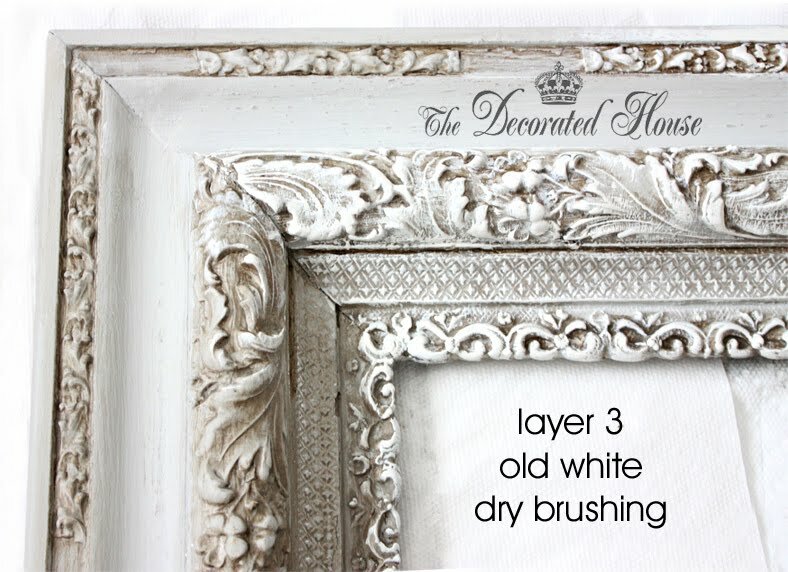 I am trying this chalk paint for the first time and can't wait. I am your newest follower. Found you on French Country Home. 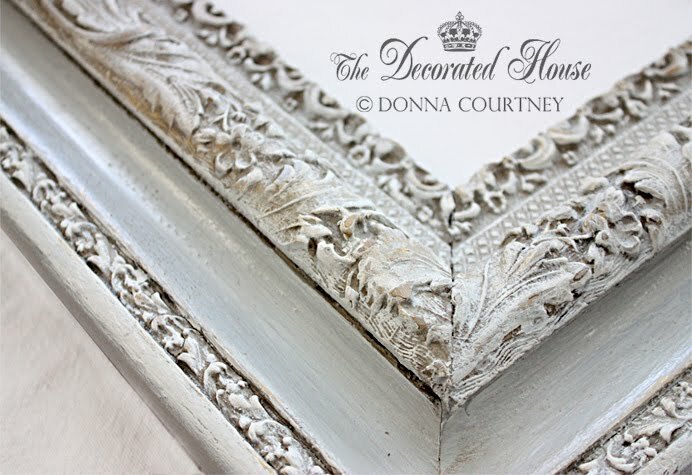 I've added a link at the bottom of the post to another layered chalk paint project as well. Some more information and ideas of using the paint, or revamping anything old. oh wow! 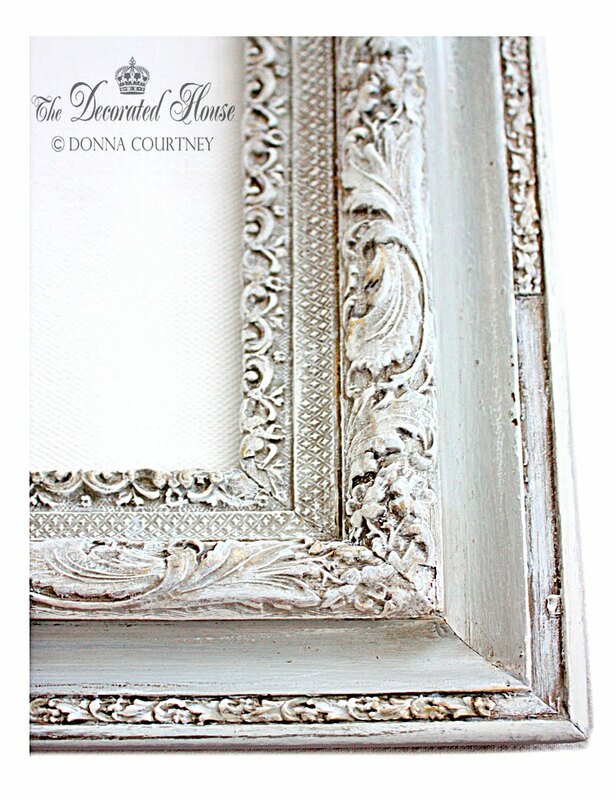 The frame looks fabulous & I love what you framed! I love what you did with these frames. I think I might have some old frames out in my shed....I'm going to go look for them right now! Oh my goodness this is gorgeous. I am moving to a new home and I have a ton of frames just sitting around that I collected over the years that just are not quite right to put up. I can't wait to do this. i would love it if you would share this wonderful post at our linky party. Hope to see you there. I have been all over your blog and am so enjoying looking at all your talent!